Prostate cancer screening in asymptomatic men is a controversial public health issue generating much debate with polarised views around the appropriate use of PSA, both internationally and within New Zealand. Currently in New Zealand, a national screening programme has not been recommended, as there is a lack of consensus as to whether the benefit of screening outweighs the harms. Prostate specific antigen (PSA) is a glycoprotein produced by the prostate gland, responsible for liquefying seminal fluid. PSA is usually present in small quantities in serum. Changes to the prostate from normal and non-cancerous conditions as well as prostate cancer, can lead to increased levels of PSA in the blood stream (see sidebar: “Non-cancerous causes of elevated PSA”). Prostate cancer screening in asymptomatic men is a controversial public health issue generating much debate with polarised views around the appropriate use of PSA, both internationally and within New Zealand. At present, NZGG does not support population screening with PSA for asymptomatic men, but they do recommend GPs advise patients of the risks and benefits of testing, as well as the likelihood of them developing prostate cancer. The Urological Society of Australia and New Zealand (USANZ)8 however, encourages all men who are interested in their prostate health to have a single PSA test and digital rectal exam (DRE) performed at, or beyond, age 40 years. Risk of prostate cancer increases with age. What is the chance of diagnosis/death for prostate cancer? Risk of diagnosis increases with a positive family history. The risk is higher if a close relative is diagnosed before 65 years, or more than one close relative is affected. PSA results between 4 and 10 μg/L are considered mildly to moderately elevated, while levels over 10 are considered high. 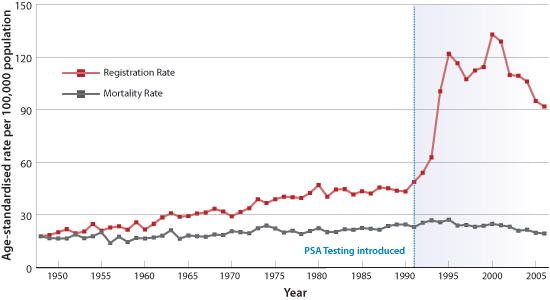 The higher the PSA, the more likely the presence of prostate cancer. However, there is no PSA level that below which a man can be reassured he definitely does not have prostate cancer. The European Randomised Study of Screening for Prostate cancer (ERSPC)11 was designed to evaluate the effect of screening with PSA on mortality from prostate cancer. The study took place between 1997 and 2006, and involved 162,387 men, aged 55 – 69 years. Men were randomly assigned either 4 yearly screening or not offered PSA testing. During a mean follow-up of 9 years, fewer prostate cancer–related deaths occurred in the screened group than in the control group. The Prostate, Lung, Colon and Ovary trial (PLCO)12 was also designed to evaluate the effect of annual PSA and DRE on mortality rate from prostate cancer. This study included 76,693 men (aged 55 to 74 years). Men were randomly assigned to either annual screening (annual PSA for 6 years and annual DRE for 4 years) or usual care (from GP). During 10 years of follow-up, researchers found no difference in prostate cancer–related deaths (roughly 85 in each group). There has been much controversy around prostate screening both in New Zealand and internationally. There remains a lack of consensus as to whether the benefits of detecting early disease by screening asymptomatic men outweigh the potential harms. It was anticipated that the long awaited results from two randomised trials (see sidebar opposite) would tell us, once and for all, whether PSA screening is beneficial. Unfortunately, there is lack of agreement on the interpretation of the results, leading to continued debate about the use of PSA testing for screening. Significant contamination of the control group: The PLCO trial was performed in the USA, which has a high level of PSA testing performed by GPs in usual day-to-day practice. As a result about 38% of the control patients had PSA testing and 44% had been tested before entry into the study. Therefore, it could be considered this was not a trial of screening versus no screening, but rather screening versus some screening. There was also some contamination of the ERSPC trial, but it was less than the PLCO trial and the trial was designed to cope with a contamination rate of 20%. Most men with an elevated PSA will proceed to biopsy. One in four prostate biopsies will find prostate cancer,1 while the risk of significant bleeding or infection is 1 to 4% of patients. For those diagnosed with prostate cancer, approximately 90% will elect to have some sort of intervention. This includes surgery, radiation therapy, or androgen deprivation. All of these treatments may be associated with adverse effects, such as urinary, bowel and erectile dysfunction. Many patients may consider the adverse effects to be acceptable trade-offs for a procedure they regard as “life saving”. There is also the argument, that any morbidity associated with intervention, is better than the morbidity from metastasised prostate cancer. Others argue that up to 50% of the prostate cancers detected would not have caused illness in the man’s lifetime.14 Therefore, for 50% of men any adverse effects from any intervention can be considered a harm. Thanks to Professor Brett Delahunt, Pathology and Molecular Medicine, Wellington School of Medicine, Wellington, for his expert guidance in developing this article. Best Practice Advocacy Centre (BPAC). 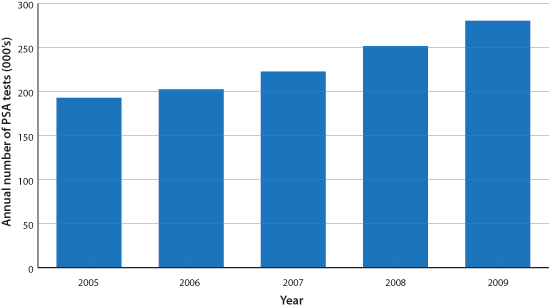 Annual Pharmaceutical & Laboratory Report 2009. D’Amico AV et al. Preoperative PSA velocity and the risk of death from prostate cancer after radical prostatectomy. N Engl J Med 2004; 351: 125-135. Schröder FH, Hugosson J, Roobol MJ, et al. Screening and prostate-cancer mortality in a randomized European study. N Engl J Med 2009;360:1320-1328. Andriole GL, Crawford ED, Grubb RL III, et al. Mortality results from a randomized prostate-cancer screening trial. N Engl J Med 2009;360:1310-1319.